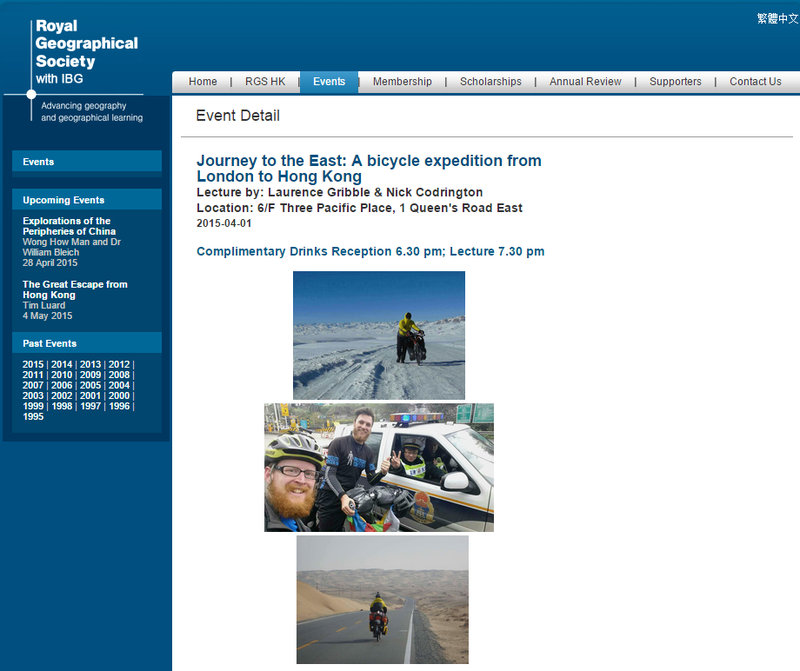 The Royal Geographical Society is pleased to welcome Laurence Gribble and Nick Codrington to lecture on “Journey to the East: A bicycle expedition from London to Hong Kong”. In this lecture, Mssrs Gribble and Codrington tell the extraordinary story of how in July 2014, fresh from their graduation from Cambridge, they set off by bicycle from Buckingham Palace on an expedition which would have them pedal over 17,000km across 20 countries. They aimed to connect Europe’s greatest city with the most dynamic place in Asia, Hong Kong via some of the world’s most exciting counties and landscapes. 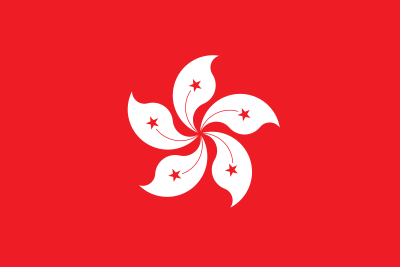 On 28 March 2015, they are going to cross the finish line at the top of Victoria Peak, after 262 days on the road. Their journey has not been easy: after a 4,000 km warm-up through Europe, they subsequently found themselves held at gunpoint in Turkey, deported from Azerbaijan, and then faced sandstorms and snow in the Kyzyl Kum desert of Uzbekistan. The expedition made it as far as Tajikistan by late-November and decided to push on eastwards to attempt a winter crossing over the Pamir mountain range into China. In the Pamirs, they confronted wolves as well as altitude sickness and temperatures of -40C. They took a short loop through Afghanistan, convincing the border general to let them visit, despite his warnings that they would not emerge in one piece. They proved him wrong and by Christmas Day were huddled in a road maintenance hut in Kyrgyzstan, sitting out a blizzard, before heading to the Chinese border which they reached for New Year 2015. During the first half of January, they cycled the Northern Silk Route along the edge of the Taklamakan desert in the Chinese Autonomous Region of Xinjiang. No one had tried a speed crossing the Taklamakan before, so they made that their next challenge, covering 550km in under 48 hours. From the icy desert, they took on the barren Tibetan Plateau, reaching the highest point of the expedition at Bayankala Pass at 4,824m. This was the peak of their physical fitness, but also the thinnest they got, losing a combined 25kg. During the last month, they have descended to a more reasonable altitude and cycled at a leisurely pace through southern China, including the fascinations of the Guizhou hill-climbs, Guangxi rice terraces and Guangdong minorities, before heading for the bright lights of Hong Kong. Laurence Gribble is from Cumbria. He spent his gap year teaching English in the international department of a school near Guangzhou. Upon returning to the UK, he read Chinese Studies at Trinity College, Cambridge University. At Cambridge, he played Eton Fives for the university, participating in Varsity matches, and played football for Trinity. He was the Vice President for the Association of British and Chinese University Students. Nick Codrington read Chinese Studies at Christ’s College, Cambridge University. 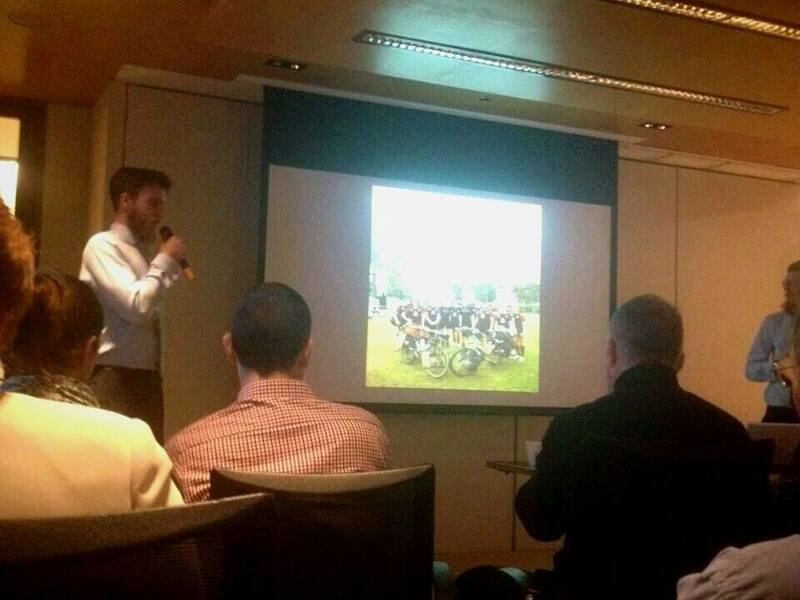 This course took him and classmate Laurence Gribble to Peking University, Beijing, for their year abroad in 2012/13. There they decided to buy cheap bicycles and cycle back to the capital from Anyang, Hebei, an amazing experience which led to their present expedition. Mr Codrington represented Cambridge at the Varsity level in both rugby and ice hockey, holds full blues and is a member of the Hawks’ Club. In April, he starts working full-time with a consultancy firm in London. Members of the RGS and their guests are most welcome to attend this event, which is HK$150 for RGS Members and HK$200 for guests and others.